The UK and France will remain “tied by bonds of friendship” for decades after Brexit, Jeremy Hunt is to say. The foreign secretary will laud the cross-channel relationship as “one of competition, co-operation, similarity and difference” in a speech in Paris. Officials said the visit was aimed at showing the friendship between the two nations was “bigger than Brexit”. But there are warnings intelligence-sharing may be damaged if a framework is not set up to mitigate the risks. A report by an Anglo-French task force whose members include former Nato Secretary General Lord Robertson and ex-French Prime Minister Bernard Cazeneuve has said co-operation in cyber security and counter-terrorism could be imperilled if the UK leaves in March without an overarching agreement. The Brexit process is at a critical phase amid reports Theresa May may seek the approval of her cabinet within days to sign up to an agreement on the terms of the UK’s’ withdrawal. Mr Hunt is one of a group of leading ministers reported to be insisting on seeing legal advice in full on the conditions of any agreement on the Irish border and how a so-called backstop arrangement – designed to keep the border open – would work. 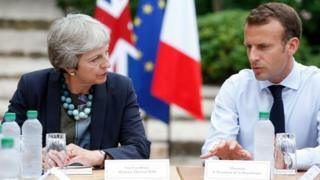 France has taken an uncompromising line on Brexit, with its President Emmanuel Macron lashing out at the UK at a summit in Austria in September, saying its exit could not be allowed to undermine European unity. But French industries also sense an opportunity to lure jobs from London, particularly in the financial services, after the UK leaves. Uncertainty has surrounded bilateral Anglo-French immigration agreements after Brexit although the UK has made it clear it wants these to continue, along with the two countries’ advanced defence co-operation. In his speech, to be delivered in French, Mr Hunt will hail what he will say has been nearly 200 years of cross-channel co-operation. He will pay tribute to Anglo-French solidarity, which he will say was encapsulated by France’s emphatic response to the poisonings of the Skripals in Salisbury earlier this year and last year’s terror attacks in London. “We will never forget the moment after the Manchester attack when President Macron walked from the Elysee Palace to the British Embassy to express France’s solidarity,” he will say. Ahead of the centenary of the end of World War One on Sunday, Mr Hunt will say the two countries’ destinies were “yoked together” by the conflict “in which we fought and bled side by side for over four years”. The foreign secretary is due to hold talks with his French counterpart Jean-Yves Le Drian on defence, national security and cyber-security. The meeting comes amid calls for the two largest military powers in Europe to step up their co-operation by consolidating a series of bilateral agreements in place since 2010. The BBC’s security correspondent Frank Gardner said Whitehall officials were insisting intelligence sharing exists outside the framework of the EU and they expect it to survive the upheaval of Brexit.